Kevin with a lion. Image Source. Kevin Richardson is a self-taught zoologist and animal behaviourist who has worked extensively with the native animals of South Africa. He currently runs the Kevin Richardson Wildlife Sanctuary at the Welgedacht Game Reserve in South Africa, mainly caring for the big cats. 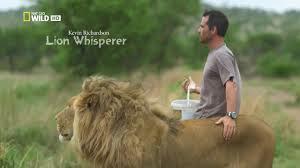 Kevin has spent 16 years of his life cultivating friendships and familial bonds within the lion prides. Hence, through his exclusive relationships with this predators, Kevin has made a name for himself in the media industry as one of South Africa’s leading animal handlers and advisor.